Jeff Jonas is the Firm’s co-hiring partner and is the Managing Director of the Restructuring & Finance Department. He represents official and ad hoc creditors’ and equity committees, individual creditors and distressed debt holders, indenture trustees, buyers of assets and other parties in bankruptcy proceedings. 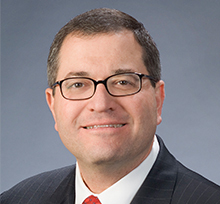 He has practiced extensively in bankruptcy courts across the country in connection with a wide range of issues, including plan confirmation and related issues, stay relief, DIP financing arrangements, cash collateral disputes, valuation issues, and dismissal and trustee litigation. Jeff also represents lenders in connection with problem business credits. He practices frequently in various state and federal courts, in connection with loan collection matters and related issues, including the defense of lender liability claims. Jeff has worked on restructurings and/or bankruptcies in the manufacturing, retail, gaming, waste, energy, airline, automotive, paper, real estate and many other sectors. Jeff also has extensive experience in real estate law and primarily represents buyers and sellers of commercial properties. He has been involved as lead attorney in acquisition, disposition and/or syndication transactions valued at more than a billion dollars. Lead attorney of team representing Catalyst Capital as plan sponsor in acquiring Pacific Exploration through insolvency proceedings in the United States, Canada and Colombia. Lead attorney in representing term loan agent in Patriot Coal bankruptcy case (Virginia) including multi-day contested confirmation trial. Co-lead attorney in representing ad hoc committee of second lien noteholders in the Energy Future Holdings (TXU) bankruptcy cases (Delaware). Lead attorney in representing Carl Icahn and affiliates in the Trump Entertainment Resorts bankruptcy cases (New Jersey), including nine-day contested confirmation trial involving competing plans of reorganization and cram-down of $500 million of secured debt. Lead attorney in representing ad hoc consortium of second lien lenders in Legends Gaming LLC bankruptcy case (Louisiana), including multi-day contested confirmation trial involving cram-down of second lien debt. Lead attorney in representing senior term lenders in Norwood Promotional Products bankruptcy case (Delaware), including successful 363 sale resulting in substantially better than anticipated recoveries. Lead attorney in representing senior term lenders in Movie Gallery bankruptcy case (Virginia) involving significant asset sales and liquidation of more than 2,600 retail store locations. Co-lead attorney in successfully representing ad hoc group of tort victims opposing Quigley Company Inc.’s bankruptcy (New York) plan of reorganization which sought to channel billions of dollars of asbestos personal injury claims (12 day contested confirmation trial). Lead attorney representing national finance company in managing distressed loan portfolio involving real estate and other loans in an aggregate amount exceeding $500 million, including restructurings, sales, foreclosures, receiverships and related activities across the country for senior, mezzanine, syndicated and participated loans. Frequently serves on American Bankruptcy Institute and other educational panels at the national and regional levels. Guest lecturer on bankruptcy issues at a combined Yale Law and Management Schools class on distressed debt. Selected to participate in the Federal Judicial Center’s Bankruptcy Workshops, the mandated continuing legal education program for U.S. Bankruptcy Judges; more than 200 Bankruptcy Judges have attended Jeff’ presentations. Recognized in Chambers USA: America’s Leading Lawyers for Business in the area of Bankruptcy Law. Recognized in Legal 500 US in the area of Finance – Corporate Restructuring. President, The Brown Rudnick Charitable Foundation. Executive Committee Member, The Boston Lawyers Group, an organization that seeks to identify, recruit, advance and retain legal talent of color in Boston’s legal community. Recipient of 2015 Caring Award from Childhelp, the national non-profit organization dedicated to fighting child abuse and neglect, for serving as pro-bono legal counsel.